Only a few hours before their flight was scheduled for take-off, six-year-old Halima came down with food poisoning. Her mother Hawa felt hot tears spring to her eyes, the strain of the moment almost too much to bear. Hawa had spent the last 20 years in Ethiopia, behind the walls of a refugee camp. Now she was making this journey without her husband, traveling for the first time on a plane, bringing her six children to their new home in America. With her youngest daughter suddenly very sick, Hawa didn’t know how she could possibly manage the trip with only a limited grasp of English. I met Hawa six years after that momentous day. Not a trace of the anxiety she felt during that plane ride was evident as we spoke. Instead, her ready smile and outgoing personality immediately charmed me. Once her U.S. Citizenship class ended for the day, she invited me home to meet her family. Later, Halima, now 13 years old, helped interpret as we talked about the more complicated aspects of their family’s history. Halima sounded and acted as All-American as these words suggest. It was what she said next that set her apart from the other girls on her team. “I’m the only Somali Muslim there.” Since Halima wears the Hijab, the fact that she’s Muslim is apparent to anyone who sees her. Yes, Somali All-American. And thanks to Halima’s poise, wit, intellect, and wisdom-far-beyond-her-years, I had the privilege of learning the details of their family’s stories from her first hand. Halima’s mother was born in a town close to Mogadishu, Somalia. Orphaned at a very young age and an only child, Hawa was raised by her grandmother, yet she looks back happily on those years. Her grandmother doted on her and gave her a comfortable, pleasant life. Like the other girls in Somalia during that period, she did not receive a formal education. Her schooling consisted of learning domestic chores: cooking, cleaning, gardening. In 1991, her life changed dramatically. Hawa turned 18 that year and was soon married. Shortly after, civil war broke out in Somalia when clan-based opposition groups overthrew the Siad Barre regime in power. Hawa’s husband worried he wouldn’t be able to keep his young wife safe. Before the fighting could reach their home, they fled across the border into Ethiopia. While Hawa recalls the people she met in Ethiopia as peaceful and welcoming, the entire time she lived there, she was not allowed to leave the refugee camp where she and her husband were placed. They got by, making new friends and finding a purpose for themselves within the camp structure. They were grateful to the International Rescue Committee (IRC) workers who ran the camp. Hawa received her first formal schooling there, eventually acquiring what she describes as a 5th grade education, including learning Arabic and some English. She also received job training, learned to sew, and eventually, landed a job making children’s school uniforms. Over the span of twelve years, Hawa gave birth to six children in their new “home.” Throughout, she continued to work. In the communal system of the camp, some women had the job of providing child care for all of the young children, allowing other parents to take different jobs. Hawa kept making uniforms. Soon after their sixth child was born, Hawa’s husband was offered the chance to leave the camp and work in Addis Ababa, where he would be able to earn money and send it back to his family. Hawa and the children were not allowed to leave, but she and her husband agreed he should take the opportunity. They looked at it as a way to provide more hope for their children, even if their future remained within the camp’s walls. At the time, they didn’t believe the whole family would receive permission to permanently resettle elsewhere. For five more years, the family lived in a state of limbo, separated and with little hope for change, until finally Hawa heard the news she had dreamed of: she and her children received permission from the U.S. government to resettle in America. Still, there were two heart-wrenching twists to this good news. One, because her husband had left the camp, he was not allowed to accompany them. The IRC workers assured Hawa, once she was in the U.S., she would be able to petition the government to allow her husband to join them. The second twist: if her husband wanted to take this chance, he would have to give up his job in Addis Ababa and return to life behind the camp walls. His potential to earn money for his family would plummet. Six-year-old Halima’s most vivid memory of life in the camp was the day her father returned to its confines. She was outside playing with friends when she looked up and saw a strange man standing before her. He had to introduce himself as the father who had left when she was just a baby. It shocked Halima that she didn’t recognize her own father. And only too soon after their reunion, the family had to leave him behind again as they set out on their journey to America. 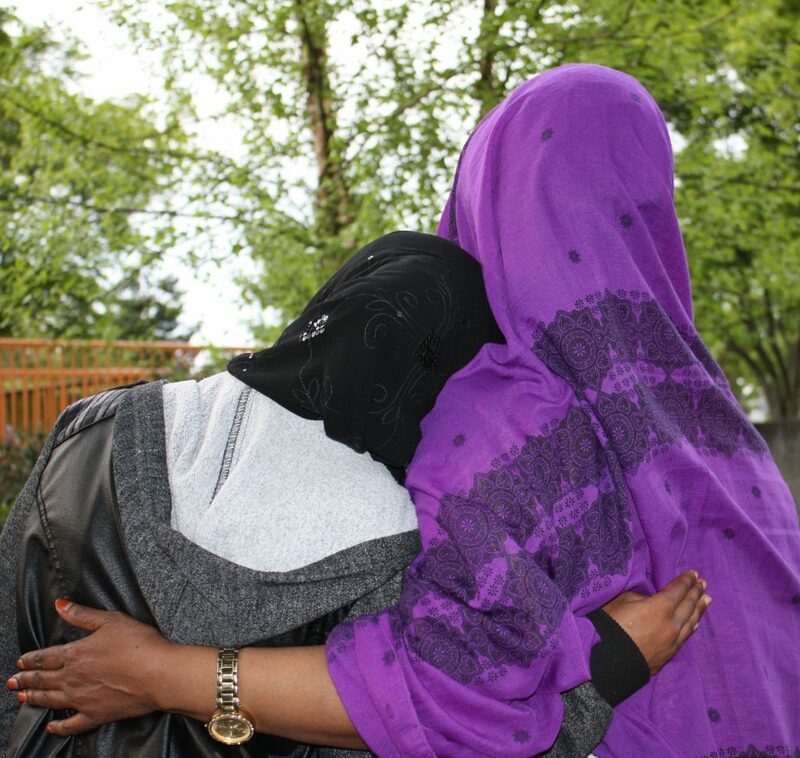 Six years ago, despite Halima’s food-poisoning, and the motion-sickness one of her sisters experienced during the flights, the family landed safely at Sea-Tac airport in Seattle, the entry into their new country. Resettlement aid-workers brought them to an apartment where they were allowed to stay for nine months. Afterwards, Hawa was forced to move with her children into a shelter until she found a job. When she secured a position at a child care center on Queen Anne Hill, she qualified for a lease on an apartment. Eventually, the family ended up at an apartment that happened to be very close to the Refugee Women’s Alliance, also known as ReWA. Their proximity to the agency was fortuitous for the family. There, Hawa received case management services, and took English-as-a-Second-Language and U.S. Citizenship classes, all while still employed at the Queen Anne child care center. While living there, Hawa’s petition to the government was approved and her husband was allowed to join them in America. They had been separated—by oceans this time—for three years. He now studies English at ReWA, as well. Halima also told me about difficult situations she’s had to face in this country. “I would get bullied a lot when I was little. One, because the water we used to drink in Ethiopia turned our teeth yellow. It damaged mine a lot… the dentist said I can’t do anything about it until I’m 18. Kids would always bully me because of that. “And when I was in first grade and it was time to wash our hands, this one kid would always put soap in my eyes. “Another time, this girl tripped me and I hit my ear on a chair. It was bleeding all over. “And kids still always ask why I cover my hair. Sometimes, kids will even pull off my scarf. The family now lives in Renton, so Hawa enrolled herself in the Saturday morning Citizenship class. It was a convenient time for her, that didn’t interfere with her weekday job at the child care center. Plus the traffic was light as she drove north to the ReWA main office building. The subject of driving itself warrants special attention. Imagine the unique challenges posed by learning to drive as a mature adult and parent of six children, some of whom were already old enough to drive themselves. Yet that is Hawa’s story. Now she gets around town confidently in her minivan. Halima’s personal story will be—in fact, already is—as much an American success story as the life her resilient mother has made for herself and for her family in this country. Hawa’s list of accomplishments is long. One of her grown children attends college, another has a good job at the airport. Halima plans to attend college and become a psychologist. Her closest sister also intends to go to college. I have children Halima’s age, and spend time with their friends, but I have never heard any other child her age speak of their parent with as much respect and clarity as Halima spoke of Hawa that day. Now, their family has wonderful news to share. On May 1, 2017, Hawa passed her U.S. Citizenship exam. The fact that she is an American citizen now means that Halima—and her brother and sister closest in age—will become citizens as well. The doors to countless opportunities have just been thrown wide open for Hawa, Halima, and their whole family. Hawa and Halima are not the real names of the subjects of this story, however, all of the details of their lives described here are true. While Hawa no longer lives near ReWA, she continues to work with an agency case manager, and hopes to enroll in ReWA’s Childcare Work Training program this summer. She remains employed at a Queen Anne child care center, but knows that receiving child care certification through the program at ReWA would allow her to qualify for promotions within her field. The author, Ramlah Ringold Olt, is the Capital Campaign Director at the Refugee Women’s Alliance, ReWA.